Although I myself am not a pasta eater, Michelle and Sean both love pasta so we do have it around the house and often make some favorite classic pasta dishes. Two of their favorites of course are lasagna and baked ziti. For me, I would rather have a sausage and peppers hero any night of the week than have baked ziti, but far be it from me to begrudge them something that they both really love. I am sure just like with lasagna, everyone has their own tried and true family recipe when it comes to making baked ziti and when we make it here, we pretty much just stick to the basics. Adjust an oven rack to the middle position and preheat the oven to 350 degrees. Bring 4 quarts of water to a boil in a large pot. Add the ziti and 1 tablespoon of salt and cook, stirring often, until the pasta begins to soften but is not yet cooked all the way through, about 5 to 7 minutes. Drain the pasta and leave it in the colander. Meanwhile, whisk the ricotta cheese and the Parmesan cheese together in a medium bowl and set it aside. Heat the olive oil and the minced garlic in a large skillet over medium heat. Cook, stirring often, until the garlic turns golden but not brown, about 3 minutes. Stir in the tomato sauce, diced tomatoes and oregano and bring the mixture to a simmer and then cook until it is thickened, about 10 minutes. Off the heat, stir in 1/2 cup of the chopped basil and the sugar and season with salt and pepper to taste. Stir the cornstarch and heavy cream together in a small bowl and transfer it to the now-empty large pot you used for the pasta and set it over medium heat. Bring the mixture to a simmer and cook until it is thickened, about 3 to 4 minutes. Off the heat, stir in the ricotta cheese mixture, 1 cup of the tomato sauce and 3/4 cup of the mozzarella cheese. Add the pasta to this sauce and toss to combine it all well. Transfer the pasta to a 13 x 9 inch baking dish and spread the remaining tomato sauce evenly over the top. Sprinkle the top with the remaining 3/4 cup of mozzarella cheese and the remaining 1/2 cup of Parmesan cheese. Cover the dish tightly with aluminum foil that has been sprayed with a nonstick cooking spray. Bake for 30 minutes, then remove the foil and continue to bake until the cheese is bubbling and beginning to brown, about 30 minutes longer. Cool the baked ziti for about 15 minutes, then sprinkle with the remaining chopped basil before serving. Sometimes Michelle does put meat in the ziti and when she does she uses about a half pound of ground beef that has been sautéed until it is browned with the garlic and the tomato sauce mixture and then mixes it in. 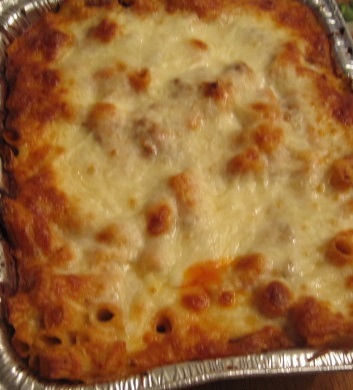 Baked ziti is a great dish to make when you are having a party or serving a buffet style meal because it goes a long way and everyone likes it. It is also something you can easily put together and take to a pot luck dinner or a party. Of course, you can easily just serve it at home as well for dinner with a nice side salad and maybe some garlic bread. That’s all I have for today. Check back next time for another recipe. I have made some good things recently to try out so there’s always plenty more to come. Until next time, enjoy the rest of your day and enjoy your meal!